Reading and share top 13 famous quotes and sayings about River In Flood by famous authors and people. 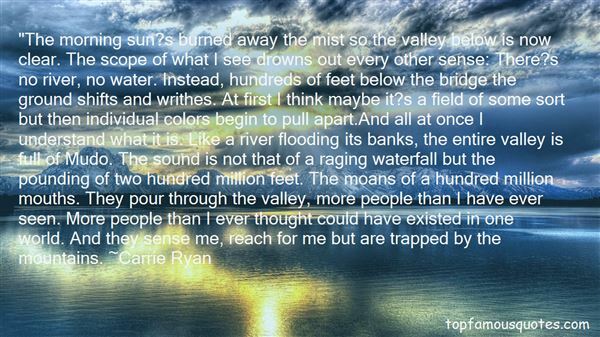 Browse top 13 famous quotes and sayings about River In Flood by most favorite authors. 1. 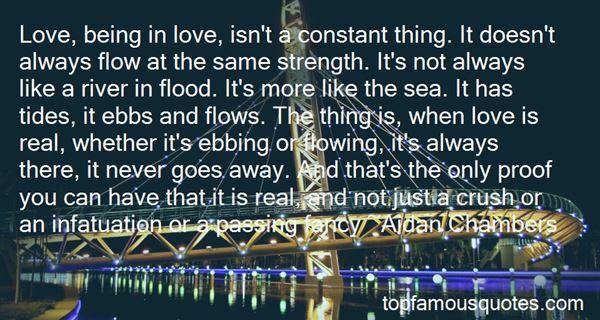 "Love, being in love, isn't a constant thing. It doesn't always flow at the same strength. It's not always like a river in flood. It's more like the sea. It has tides, it ebbs and flows. The thing is, when love is real, whether it's ebbing or flowing, it's always there, it never goes away. And that's the only proof you can have that it is real, and not just a crush or an infatuation or a passing fancy"
2. "All day long we seemed to dawdle through a country which was full of beauty of every kind. Sometimes we saw little towns or castles on the top of steep hills such as we see in old missals; sometimes we ran by rivers and streams which seemed from the wide stony margin on each side of them to be subject of great floods. It takes a lot of water, and running strong, to sweep the outside edge of a river clear." 3. ""The morning sun?s burned away the mist so the valley below is now clear. The scope of what I see drowns out every other sense: There?s no river, no water. Instead, hundreds of feet below the bridge the ground shifts and writhes. At first I think maybe it?s a field of some sort but then individual colors begin to pull apart.And all at once I understand what it is. Like a river flooding its banks, the entire valley is full of Mudo. The sound is not that of a raging waterfall but the pounding of two hundred million feet. The moans of a hundred million mouths. They pour through the valley, more people than I have ever seen. More people than I ever thought could have existed in one world. And they sense me, reach for me but are trapped by the mountains." 4. "Ah, drink againThis river that is the taker-away of pain,And the giver-back of beauty!In these cool wavesWhat can be lost?--Only the sorry costOf the lovely thing, ah, never the thing itself!The level flood that lavesThe hot browAnd the stiff shoulderIs at our temples now.Gone is the fever,But not into the river;Melted the frozen pride,But the tranquil tideRuns never the warmer for this,Never the colder.Immerse the dream.Drench the kiss.Dip the song in the stream." 5. "When Jordan was a baby he sat on top of me much as a fly rests on a hill of dung. And I nourished him as a hill of dung nourishes a fly, and when he had eaten his fill he left me.Jordan...I should have named him after a stagnant pond and then I could have kept him, but I named him after a river and in the flood-tide he slipped away." 6. "Of four infernal rivers that disgorge/ Into the burning Lake their baleful streams;/Abhorred Styx the flood of deadly hate,/Sad Acheron of sorrow, black and deep;/Cocytus, nam'd of lamentation loud/ Heard on the rueful stream; fierce Phlegethon/ Whose waves of torrent fire inflame with rage./ Far off from these a slow and silent stream,/ Lethe the River of Oblivion rolls/ Her wat'ry Labyrinth whereof who drinks,/ Forthwith his former state and being forgets,/ Forgets both joy and grief, pleasure and pain." 7. 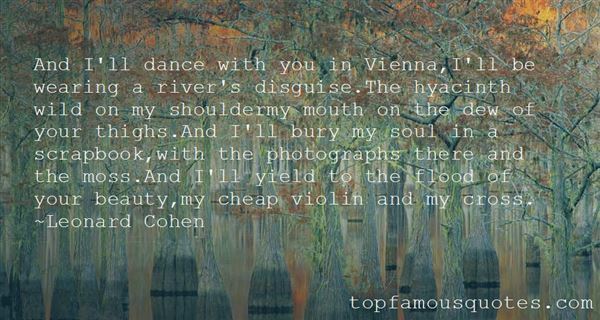 "And I'll dance with you in Vienna,I'll be wearing a river's disguise.The hyacinth wild on my shouldermy mouth on the dew of your thighs.And I'll bury my soul in a scrapbook,with the photographs there and the moss.And I'll yield to the flood of your beauty,my cheap violin and my cross." 8. "Memories of the past year came tumbling down on me. The recent changes and reverses were almost overwhelming. I was learning that life flowed like a river. When the run-off was normal, the water ran smoothly. But if there came a downpour, it gushed. In the likeness to a flooding river, life events were caught up in the course of the devouring stream." 9. "Kay found six and a half acres of land just off the Ouachita River at the mouth of Cypress Creek outside of West Monroe, Louisiana. It was at the end of a dirt road in one of the most heavily forested areas on the river. The classified advertisement in the newspaper described it as a "Sportsman's Paraside." When we drove out to see the land, I knew it was perfect as soon as we crested the hill that leads down to the house where we still live today. The place was absolutely perfect. The real estate lady sensed my excitement and told me, "Now, Mr. Robertson, I'm required by law to inform you that this home sits in a floodplain. ""Perfect," I told her. "I wouldn't want it if it didn't." 10. "The graveyard was at the top of the hill. It looked over all of the town. The town was hills - hills that issued down in trickles and then creeks and then rivers of cobblestone into the town, to flood the town with rough and beautiful stone that had been polished into smooth flatness over the centuries. It was a pointed irony that the very best view of the town could be had from the cemetery hill, where high, thick walls surrounded a collection of tombstones like wedding cakes, frosted with white angels and iced with ribbons and scrolls, one against another, toppling, shining cold. It was like a cake confectioner's yard. Some tombs were big as beds. From here, on freezing evenings, you could look down at the candle-lit valley, hear dogs bark, sharp as tuning forks banged on a flat stone, see all the funeral processions coming up the hill in the dark, coffins balanced on shoulders. ("The Candy Skull")"
11. "I've got my own moral compass to steer byA guiding star beats a spirit in the skyAnd all the preaching voices -Empty vessels ring so loudAs they move among the crowdFools and thieves are well disguisedIn the temple and market placeLike a stone in the riverAgainst the floods of springI will quietly resistLike the willows in the windOr the cliffs along the oceanI will quietly resistI don't have faith in faithI don't believe in beliefYou can call me faithlessI still cling to hopeAnd I believe in loveAnd that's faith enough for meI've got my own spirit level for balanceTo tell if my choice is leaning up or downAnd all the shouting voicesTry to throw me off my courseSome by sermon, some by forceFools and thieves are dangerousIn the temple and market placeLike a forest bows to winterBeneath the deep white silenceI will quietly resistLike a flower in the desertThat only blooms at nightI will quietly resist"
12. "That place where I was born was a cold town. Even the mountains stood away. They were not sure, no more than me, of that dark spot, those same mountains.There was a black river that flowed through the town, and if it had no grace for mortal beings, it did for swans, and many swans resorted there, and even rode the river like some kind of plunging animal, in floods." 13. "You know, they straightened out the Mississippi River in places, to make room for hourse and livable acreage. Occasionally the river floods these places. "Floods" is the word they use, but in fact it is not flooding; it is remembering. Remembering where it used to be. All water has a perfect memory and is forever trying to get back to where it was. Writers are like that: remembering where we were, that valley we ran through, what the banks were like, the light that was there and the route back to our original place. It is emotional memory--what the nerves and the skin remember as well as how it appeared. And a rush of imagination is our "flooding." Free enterprise is essentially a formula not just for wealth creation, but for life satisfaction."